Most times the herd of cattle gets moved to a new paddock daily. Over the course of the season it is sometimes 2 days, but not usually more than that. Just the other day they moved onto a smaller section that was quite overgrown. The grass was waist high, and thick, but a smaller area. 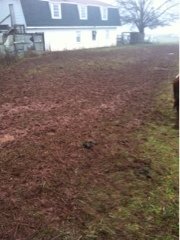 The result was quite quickly, in less than 24 hours, an entire area of mud. The ground is not yet frozen, what is falling from the sky is rain not snow, and that just means nastiness. It's a mudder out there.